Woman of Wisdom Who is Brigit? That is not an easy question to answer for her origins are lost to our view, and in later years it is hard to tell the Celtic Goddess apart from the Christian Saint of the same name. And yet, perhaps it s a quality of Brigit herself that she cannot be readily categorized. For the lore of both goddess and saint she seems to have been the overarchig benefactor of every aspect of the life of people and the land. In fact, it might be said that Brigit is the nearest thing we have to a Great Mother of the Celts. _______________________________ THE EXALTED ONE It is tempting to view this tender goddess of the early Spring only as she is pictured in Scottish artist John Duncan�s famous picture, The Coming of Bride: a wide-eyed, golden-haired girl, encircled by children. But behind her girlish innocence is the power of a once-great ancestral deity, Brigid, whose name means �The Exalted One,� queen and mother goddess of many European tribes. 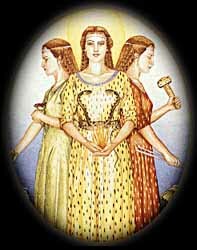 She is also known as Brigid, Bridget, Brighid, Brighde, Brig or Bride and some scholars consider her name originated with the Vedic Sanskrit word brihati, an epithet of the divine. The 10th century Cormac�s Glossary describes her as the daughter of the Daghda, the �Great God� of the Tuatha de Danaan. He calls her a �woman of wisdom�a goddess whom poets adored, because her protection was very great and very famous." Since the discipline of poetry, filidhect, was interwoven with seership, Brigid was seen as the great inspiration behind divination and prophecy, the source of oracles. Some Irish rivers bear her name, as do places as far apart as Breconshire in Wales, Brechin in Scotland and Bregenz in Austria, which was once the capital of the Brigantii tribe. This tribe was under the tutelage of the goddess Brigantia, who is thought to be another aspect of Brigid. The most powerful political unit of Celtic-speaking Britain, the Brigantii mostly held sway in Northern England, where place-names and rock-carvings still echo the presence of their mother-goddess.